Over the last few months I have installed more beta software on my main machine than I should have. This is always a risky proposition and on occasion this glut for knowledge can back fire. The two worst beta offenders have been IE8 and the now obsolete Silverlight 2 beta. Both products have combined to waste hours of my time during the initial use and subsequent uninstallation process. As you can imagine I have been very reluctant to put any more new beta software on my PC (I should really start using Virtual PCs). 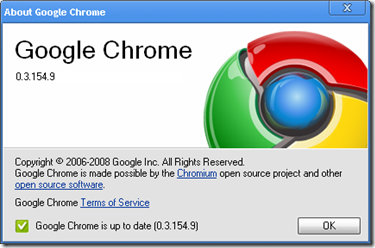 One ray of light in the recent installation wars has been my adoption of Google Chrome. 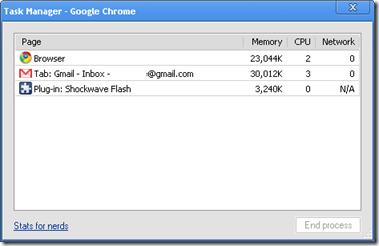 I have been really impressed by how snappy it is and when I saw that it has a task manager for plug-ins that are running in the browser there was no looking back! I have been convincing myself that this is not a beta because it does not say so in the about screen. However, any version number under 1.0.0 cannot surely be anything else. 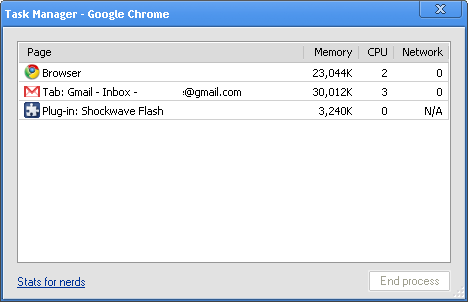 Either way Chrome is giving me significantly less problems than IE8 and may actually be better than FireFox, and for that I will remain eternally grateful.